Most of the engimonos comes from Shintoism or Buddhism. I list many kinds of engimono as follows. 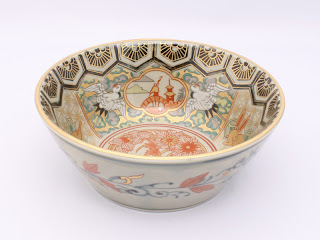 and see them in Japanese pottery. Crane (Tsuru): Crane has a long life span. Japanese proverb “Crane has 1000 year life span. So, the crane is a symbol of long life. and is a symbol of long life too. Goldfish (Kingyo): They have white and red patterns. Carp (Koi): They have white and red patterns. White snake (Shiro-hebi): White is a symbol of Shintoism. The white snake is a messenger of god and a god of water. Red snapper (Tai): “Medetai” is happy in English. Tai is a part the word. That’s the reason it is a happy symbol. Frog (Kaeru): “Kaeru” is frog and return in Japanese. because they want customers come back. because they wish their family to come back safely every day. Raccoon (Tanuki): Raccoon is “tanuki” in Japanese. “Ta” is other and “Nuku” is overtake or get ahead in Japanese. and to get the advantage. Other animals: Rabbit, Owl and Cat.